Detailed driver notes and statistics to help set your fantasy racing lineup for Sunday’s Can-Am 500 at ISM Raceway. Kevin Harvick has won seven of the last 12 races and has a 3.1 average finish in that span. He will have Tony Gibson for his interim crew chief after the No. 4 team as penalized this week. Kyle Busch, who led 128 laps en route to a second-place finish in the spring, has finished seventh or better in his last six starts. Denny Hamlin, who led 193 laps in this event last fall, has finished in the top 10 in five of his last six starts. Chase Elliott, who combined to lead 140 laps in the two races last year, has posted a 6.8 average finish in his five starts. Martin Truex Jr., who won the pole in the spring, has finished in the top five in his last two starts. Erik Jones has finished ninth or better (7.0 average finish) in his three starts. Kyle Larson, who had an engine failure last fall, has started in the top seven in the last six races at ISM with two top five finishes. He led 54 laps in the spring before a spin and ranks second in stage points earned at ISM. Joey Logano has finished in the top 10 in six of the last 10 races, including a win in the 2016 fall race. He finished 12th in this event last year. Logano has also led 411 laps in the last five races this season at tracks exactly 1-mile in length or shorter. Kurt Busch finished 10th in the spring for his sixth top 10 in nine ISM starts with Stewart-Haas Racing. Aric Almirola has recorded top 10s in his last two starts at ISM. Brad Keselowski has finished in the top 10 in five of his last nine starts at ISM. Keselowski has also led 224 laps in the last five races this season at tracks exactly 1-mile in length or shorter. Alex Bowman has posted a 9.5 average finish in his two starts in the No. 88 Chevrolet at ISM, including leading 194 laps in this event in 2016 when he subbed for Dale Earnhardt Jr.
Clint Bowyer has finished in the top 10 in seven of the 10 races this season at tracks 1.058-miles or less in length. Jimmie Johnson has finished in the top 15 in nine of those races, including six top 10s. Defending event winner Matt Kenseth, who did not race in the spring at ISM, will make his 14th start of the season with Roush Fenway Racing – his best finish with the team is 12th at Indianapolis. Daniel Suarez, who has finished in the top 10 in the last two races this season at tracks 1-mile in length or shorter, has an 11.0 average finish (two top 10s) in three starts at ISM. Ryan Blaney (defending event pole winner) and Ricky Stenhouse Jr. each have two top 10s in the last five races at ISM. Notes: Monster Energy Cup Series teams will be running a new right-side tire this weekend at ISM…The left-side tire codes are the same ones that have been used at Phoenix since 2016…Denny Hamlin, Matt Kenseth, Kyle Larson and Paul Menard participated in the Goodyear tire test at ISM last month…This weekend will mark the 15th race since the track was repaved and reconfigured…However, Sunday’s race will be the first with the start/finish line in a new location and a new pit road layout…The third starting position has produced the most race winners (6) at ISM with Dale Earnhardt Jr. the last to win from that position in this event in 2015…Kevin Harvick won from the 10th starting position in the spring…Hendrick Motorsports is the winningest organization at Phoenix with 10 victories. * – The best average finish is based off a driver entered in the race who has competed in every race during that time span. 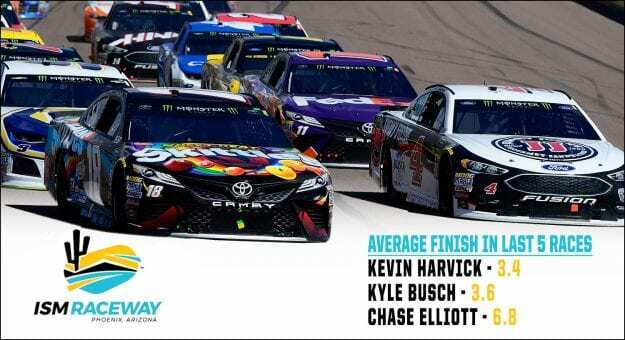 Click Here to view all laps led leaders at ISM Raceway over the past 10 races. 3. Kyle Larson 3. Ricky Stenhouse Jr.
8. Kurt Busch 8. Martin Truex Jr.
Sunoco Rookie of the Year candidates William Byron and Bubba Wallace finished 12th and 28th, respectively, in their first Monster Energy NASCAR Cup Series start at ISM Raceway in the spring. Byron and Wallace have respective average finishes of 19.7 and 27.8 in the nine races this season at tracks 1-mile in length or less. Byron’s advantage in the rookie standings is 116 points. Kevin Harvick has finished sixth or better in the last 10 races at ISM, which includes six wins in that span. Harvick led for the first time in the last four races in the spring when he was up front for 38 laps en route to the victory. Harvick leads all drivers with 1,205 laps led in the 14 races since ISM was repaved and reconfigured. This week the No. 4 team was hit with a L1 penalty after his win at Texas and sits three points above the cutoff. Harvick’s crew chief for the final two races of the season will be Tony Gibson. Kyle Busch has finished seventh or better in the last six races at ISM that includes two-runner up finishes with the most recent in the spring. Busch led a race-high 128 laps in the spring for his 10th top 10 in 13 starts on the current track surface. He also leads all drivers with 41 stage points earned in the last three races. Chase Elliott has finished in the top 10 in four of his five starts at ISM, including a runner-up finish last fall. In the 2017 spring race, Elliott led 106 laps but finished 12th after pitting and being behind cars with older tires on the final restart. Elliott ranks third in laps led (140) and stage points (32) in the last three races at ISM. Erik Jones has finished in the top 10 in the last three races at ISM to give him an average finish of 7.0 in that span. Jones, who has yet to lead a lap at ISM, saw his best finish at the track come last year in this event, fourth. He ranks eighth in stage points (17) at ISM. Alex Bowman finished 13th in the spring in his first start at ISM as the full-time driver of the No. 88 Chevrolet. Bowman’s previous start at ISM came in the 2016 fall race when he subbed for Dale Earnhardt Jr. and led 194 laps en route to a sixth-place finish. He did not record any stage points in the spring race. Daniel Suarez has posted an 11.0 average finish in his three Cup Series starts at ISM. He finished eighth this year for his second top 10 in the spring race. Denny Hamlin led 33 laps and finished fourth for his fifth top 10 in the last six races at ISM. Hamlin dominated this event last year, leading 93 laps, but his day ended on lap 275 after a tire went down following contact with Chase Elliott in a side-by-side battle. His 35th-place finish snapped a streak of four consecutive top 10s. Hamlin’s lone win at ISM came in this event in 2012 – the second race since the track was repaved and reconfigured. Hamlin, who participated in the Goodyear tire test last month, ranks fourth in stage points earned in the last three races at ISM. Kurt Busch has finished in the top 10 in six of his nine starts with Stewart-Haas Racing at ISM, including a 10th-place finish in the spring. Busch does have one win at ISM but that came in 2005 on the old configuration. Since the track was reconfigured and repaved, Busch has posted eight top 10s in the 14 races. His first stage points at ISM came this past spring with finishes of eighth and first. Aric Almirola is coming off his second consecutive top 10 at ISM with a seventh-place finish. The spring finish came in his first track start with Stewart-Haas Racing. He has yet to record a stage point in the last three races at ISM. Martin Truex Jr. is coming off two consecutive top fives at ISM. He won the pole in the spring and finished fifth. Truex has earned stage points in four consecutive stages at ISM for a total of 19 points, which ranks seventh among all drivers. Jamie McMurray finished sixth in this event last year for his third top 10 in 14 starts at ISM. McMurray has recorded stage points in three of the six stages at ISM with the last coming in the second stage in this event last year. Ryan Blaney has posted a 14.8 average finish in his five starts at ISM. His first two starts resulted in top-10 finishes. Last fall he won the pole and led 11 laps, but finished 17th after staying on track during late-race cautions, which put him at a disadvantage to drivers behind him with fresher tires. Blaney finished 16th in the spring in his first track start with Team Penske. Kyle Larson led 54 laps in the spring at ISM, but spun on Lap 123 and finished 18th in the end. He led 12 laps last fall but finished 40th after an engine failure. The result snapped a streak of two consecutive top-three finishes. Larson, who participated in the Goodyear tire test last month, ranks second in stage points (36) in the last three races at ISM. Brad Keselowski saw his last top 10 at ISM come in the 2017 spring race. The fifth-place finish in that race was his eighth top 10 in the 14 races wince ISM was repaved and reconfigured. Keselowski scored stage points in both stages in the spring to push his ISM stage point total to 27. In the final quarter of the race, crew chief Paul Wolfe kept Keselowski on the track as long as possible before making his final stop with hopes of catching a yellow flag to pit with the leaders. The yellow did not come out and he finished 15th. Joey Logano scored his first win at ISM in the fall 2016 race after leading 58 laps. Logano has qualified in the top 10 in nine of the last 10 races, including a pole in the 2017 spring race. He led 82 laps from the pole, but finished 31 after a tire went down late in the race. Logano finished 19th with an ill-handling car in the spring for his fourth finish outside the top 10 in the last five races.